Coming from the South, take Marine Corps Dr. north to the village of Dededo. Pass the Micronesia Mall until you reach a 3 way stop light with KFC and Winchells on opposite sides of Marine Corps Dr. and make a right turn on Macheche Ave. Follow this road 3 blocks and PRC will be on your left on the corner of E. Nandez Avenue. Our sign is out front. Coming from the North, take Marine Corps Dr. south to the village of Dededo. You reach a 3 way stop light with KFC and Winchells on opposite sides of Marine Corps Dr. and make a left turn on Macheche Ave. 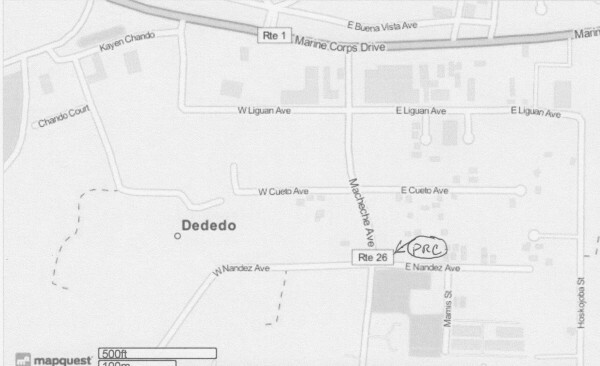 Follow this road 3 blocks and PRC will be on your left on the corner of E. Nandez Avenue. Our sign is out front.